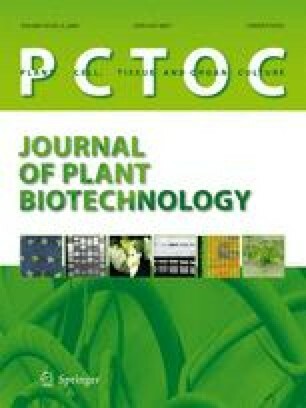 The effects of a range of plant growth regulators on callus production in various Ephedra species were examined. Species examined were E. andina, E. distachya, E. equisitina, E. fragilis var, camplyopoda, E. gerardiana, E. intermedia, E. major ssp procera, E. minima and E. saxatilis. All species produced callus on modified MS medium supplemented with 0.25 μM kinetin and 5.0 μM 2,4-dichlorophenoxyacetic acid or 1-naphthaleneacetic acid. Neither indole-3-acetic acid nor 3-indolebutyric acid induced significant callus formation but the latter maintained growth of established callus cultures in several species. Suspension cultures of several species were established in MS medium supplemented with 0.25 μM kinetin and 5.0 μM 2,4-dichlorophenoxyacetic acid or 1-naphthaleneacetic acid. Sustained fresh weight doubling times of 70±7h were recorded for cell suspension cultures of E. andina grown in a semi-continous air-lift bubble bioreactor and a minimum doubling time of 56 h was recorded for E. andina in batch culture. It also proved possible to immobilise E. andina batch cultures in sodium alginate beads. Neither parent plants or in vitro cultures of E. distachya, E. fragilis or E. saxatilis produced alkaloids. Trace quantities of 1-ephedrine and trace-0.14% dwt d-pseudoephedrine were produced by in vitro cultures of other species. The ability to produce alkaloid diminished to zero with successive subcultures.